The semiautonomous Kurdish region in northern Iraq has struck a deal with a foreign oil company to drill for oil in a mountainous region just outside this town. Kurdish leaders hope the new oil well will spur further exploration in the area and tighten the regional government's control over its oil wealth. A Kurdish official speaks at ceremony to mark the first foreign company to drill for oil, in post-war Iraq, in the northern town of Zakho on November 29, 2005. Sunni Arab leaders in Iraq voiced anger on Wednesday over a Norwegian company's oil deal struck exclusively with Kurds in the north and warned such projects could deepen sectarian divisions. Picture taken November 29, 2005. REUTERS/Murad Jambaz. But the agreement has raised eyebrows in Baghdad, where Kurdish aspirations for autonomy are viewed critically by some Sunni and Shiite Muslims. It was the first time the Kurdish regional government contracted directly with a foreign company to explore for oil. Motasam Akram Hassan, deputy oil minister in Baghdad, acknowledged the concerns. Some "people don't like Kurdish people. They say they drill oil and want oil for themselves," he said. Yet, Hassan said the Kurdish government received approval from the ministry to negotiate the deal. The Kurdish regional government unveiled the rig just weeks before next Thursday's parliamentary elections. Regional autonomy and the distribution of oil revenue have emerged as key issues. "With the commencement of the (Zakho) drilling, Sunni politicians have seized on the event in an attempt to make it a major election issue," said Peter Khalil, a Middle East analyst at Eurasia Group, a political risk consulting firm based in New York City. The control of Iraq's oil wealth - concentrated in the Shiite south and around Kirkuk in the north - was also hotly debated during the writing of the country's new constitution. The document, approved in a referendum Oct. 15, says oil revenue should be distributed by the central government in Baghdad, but other details remain vague. "Given the vagueness of the language in the constitutional provisions determining oil policy, the uncertainty will likely cause further disputes in 2006," Khalil said. Some Kurdish politicians are now campaigning on a platform that advocates changing the constitution and giving Kurds more control over their oil wealth. "To be able to benefit from the natural resources we have, we have to go to the ballot box in the election," said the prime minister of the region, Nichervan Barzani. Most of the oil production in the north is around the city of Kirkuk, just outside the Kurdish-controlled region. Iraq has an estimated 115 billion barrels of proven reserves, the world's third largest, according to the Oil & Gas Journal. Iraq is producing about 2.1 million barrels of crude per day now, down from a peak of 3.7 million barrels before Iraq invaded Kuwait in 1990, according to the U.S. Department of Energy. The Kurds reached an agreement with a Norwegian oil company, DNO, to build the rig about 12 miles from here in a mountainous region where black pools of oil seep effortlessly through the ground. The rig was unveiled in a ceremony last week. It will take at least two months to dig through 3,000 meters of rock and clay, said Tarik Abdullah Chalabi, the general manager of the project. DNO expects to tap an oil basin 19 miles long by 5 miles wide. 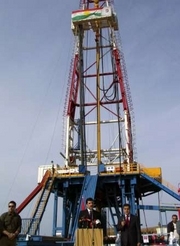 It is the first new well in Iraq since 1991, Iraq's Oil Ministry said. The Kurds hope the DNO deal will jump-start production inside the Kurdish-controlled region, which historically has produced little. "We will find sufficient amounts of oil that it's commercially viable to exploit," said Magne Normann, the company's vice president. About nine foreign oil companies are active in Iraq's Kurdish region. DNO is the first to strike a deal directly with the regional government in the Kurdish north instead of going through the oil ministry in Baghdad. "If everything is in the hands of Baghdad, the opportunity for abuse can happen," said Stafford Clarry, an adviser to the regional government.